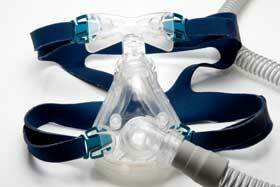 A sleep apnea or CPAP mask is designed to be used with a continuous positive airway pressure device or CPAP machine. They vary in design, size, composition and price. The main concern is that they work with the CPAP device. Research has shown that CPAP masks are effective and do improve the sleep of most sleep apnea patients. Dr Jong-Won Kim and colleagues from the University of Sydney studied sleep patterns of 113 patients using polysomonography and found improvement in 70 percent of cases. Your healthcare practitioner may recommend a specific type or brand. It’s always best to follow their advice. A cheaper model might be less comfortable or could be faulty. Remember that your goal is to get a good night’s sleep, keep your blood oxygen levels high and breathe normally. A proper fit is an absolute necessity. If you are unable to try it on for size, check the company’s exchange or return policies, to ensure that improper fit is grounds for a return. Most companies are willing to work with you, but it is always a good idea to check ahead of time. Your health insurance may cover a sleep apnea mask. Most policies do, if the device is a medical necessity. Considering that you could stop breathing without it, most companies now consider it a necessity. So, they are covered in most cases. Some variations include the headgear to ensure that the breathing apparatus stays in place as you move about in your sleep. If you find that the headgear is uncomfortable, other styles are available. Before the CPAP device was recommended, your doctor probably suggested other tactics, such as sleeping on your side or with your bed elevated at a 30 degree angle. It’s smart to continue with those recommendations, as long as they do not interfere with the apparatus. Sleep apnea masks can be used in combination with a special sleep apnea pillow that help to keep the airways open as you sleep. Not all insurance companies cover the special pillows. But, they could be a worthwhile investment if the quality of your sleep and comfort are improved. 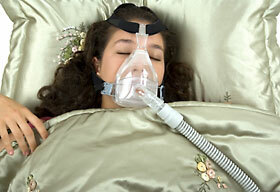 Most people feel that a “comfort-gel” sleep apnea mask is the most comfortable. The gelatin combined with a soft plastic conforms to your face and nasal passages. The only complaints concern the lifespan. The gel-types don’t seem to last as long as the harder plastics. For people that have a hard time getting a good fit, the comfort-gel can be heated and molded to accommodate the hard to fit areas. For most people, simply choosing the right size is enough, without boiling the mask, but it is always nice to have the option. When you are buying sleep apnea masks, be sure that the bridge is adjustable. Otherwise, you’ll end up with a sore nose in the morning. There are many different styles of sleep apnea masks and you will want to ensure that you find the one that suits you the best. Although your insurance provider may not cover more than one mask you may wish to get an addition a mask to reduce discomfort that can arise from wearing the same mask every night. Depending on your condition it might be possible to use an oral mask that delivers the air through the mouth. However, an oral sleep apnea mask might not be suited to you if you grind your teeth or have had oral surgery. Another option is the nasal pillow, where instead of using a mask you would insert "mushroom cap" shaped ends connected to tubing into your nostrils. Each of these approaches has pros and cons that may limit their effectiveness for you. Consult with your doctor or dentist and be aware of the many options that exist and you will find the best fit for you.